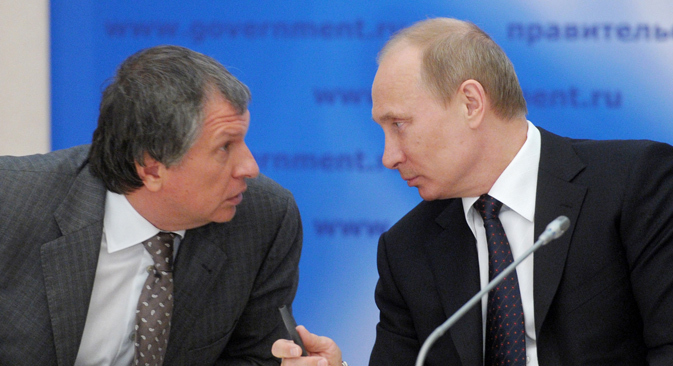 Two of Russia’s largest state companies – Rosneft and Russian Railways – have disclosed the salaries of their top managers, although both earlier repeatedly refused to do so. While corporate executives in Russia earn less than their foreign counterparts, they take home thousands of times more than ordinary Russians, many of whom are struggling to make ends meet because of the crisis. Russia's largest oil company – state-owned Rosneft – has disclosed the income of its top management, its press service has said in a statement. The maximum salary of the president of the company, Igor Sechin, a former deputy prime minister who is considered to be a personal friend of Vladimir Putin, amounted to 600 million rubles ($11.6 million) a year, including bonuses. Following Sechin’s disclosure, the head of another state-owned corporation, Russian Railways boss Vladimir Yakunin, has also disclosed his income. He earns 48-66 million rubles ($0.95-1.3 million) a year, excluding bonuses, according to news agency Interfax. Previously, both Yakunin and Sechin had refused to disclose their incomes. However, Russian President Vladimir Putin recommended that the heads of state corporations report their incomes during his annual live TV phone-in with Russians in April 2015. "Top managers of state corporations understand that such salaries are out of step with other economic indicators of modern Russia. If they were consistent with other indicators, there would not be such games surrounding the disclosure of information," said Sergei Smirnov, Doctor of Economics and director of the Institute for Social Policy and Socio-Economic Programs at the Higher School of Economics in Moscow. According to Smirnov, when Russians' average salary is 33,200 rubles per month ($654), or about $7,800 a year, the huge sums earned by top executives of state corporations cause uproar among the public. "Against the background of the crisis, the wages look outrageous, and no one has heard of any top managers reducing their salaries in connection with the crisis," he said. According to Smirnov, the public does not understand on what basis a person is appointed to high office and sees the high salaries paid to these people as ridiculous in light of the fact that companies such as Rosneft and Russian Railways actually request subsidies from the state. Rosneft claims 200-250 billion rubles ($3.9-4.9 billion) from the National Welfare Fund, a sovereign wealth fund built on oil and gas revenues, to finance new projects, Smirnov said. Russian Railways, meanwhile, requests 500 billion rubles ($9.8 billion) from the budget to ensure financial stability. At the same time, Finam analyst Timur Nigmatullin estimates that the total income of the head of Rosneft roughly corresponds to international standards. "It roughly corresponds to the income of the head of BP," he said. For comparison, according to the business daily Vedomosti, in 2014, the total pay of the president of Exxon Mobil Corporation, Rex Tillerson, was $33.1 million, while Robert Dudley of BP took home $15.33 million, and John Watson of Chevron pocketed $25.97 million. "Today, a CEO in the United States earns an average of 15-20 times higher than his Russian counterpart," said the head of the Management Department of the Russian Presidential Academy of National Economy and Public Administration, Ilya Bykovnikov. According to Bykovnikov, the highest-paid top manager in the United States, according to the results of 2013-2014, is Anthony Petrello, the head of Nabors Industries, a company specializing in the provision of oilfield services, who earned $68.3 million. He is followed by Leslie Moonves of the television and radio corporation CBS, who received $65.6 million over this period. However, according to Nigmatullin, it is incorrect to compare the incomes of heads of companies from different countries with different ownership structures and management incentive policies. "Since the factor of corruption is objectively greater in Russia, the shareholders establish the highest possible salaries for managers to defend their rights," he said. Otherwise, Nigmatullin added, the management will not be interested in the effective development of the company, and from this perspective, the "incomes of the heads of Russian companies are even not large enough."